There is not a direct replacement available for the Z2Ten. The analog feedback function can be replicated using the OW-IO-AI4 - 4 Channel Analog Input or OW-IO-AI8 - 8 Channel Analog Input. Single 0-10 Volt Analog output. 12-bit Analog feedback from control output. Unique 64 bit registration number. 2” X 2.5” X 1” ABS Enclosure. The Z2TEN is a 0-10 Volt analog output generator with a built in interface for multidrop with other 1-Wire devices in a CAT-5 twisted pair network of up to 1000 feet and as many as 100 devices. The Z2TEN has a built-in multidrop controller (DS2406) which provides a unique 64 bit registration number (8-bit family code + 48 bit serial number + 8 bit CRC) assuring error-free selection and absolute identity; no two parts are alike. Unique addressing allows I/O function to be identified absolutely. The Z2TEN provides a 12-bit resolution 0-10 Volt analog output from digital commands received on a 1-Wire bus. A 12-bit A-to-D provides feedback directly from the generated output. 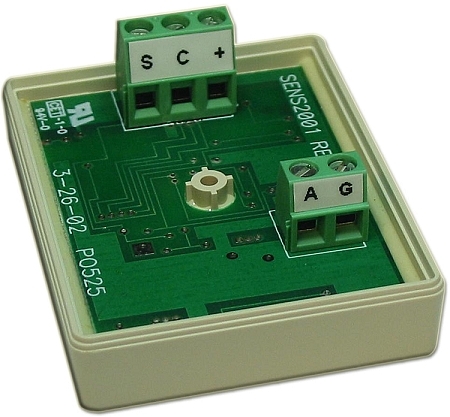 This provides a closed loop for ensuring that the desired control output is being generated. The Z2TEN is designed to operate in a network of EDS 1-Wire digital and analog modules. Only two network connections are required: common(“C”) and data signal(“S”). The Z2TEN requires 12-16V DC power at very low current. The Z2TEN is enclosed in an ABS enclosure 2” X 2.5” X 1”. All connections are made with Phoenix screw connectors. The Z2TEN can be connected in a 1-Wire network for continuous polling (with OneSix). The Z2TEN requires a 1-Wire host interface or adapter such as the EDS HA3, HA4, HA5, HA7E, HA7Net, HA7S, or Dallas Semiconductor DS9490R, DS9097U, DS9097E. 1-Wire is a registered trademark of Dallas Semiconductor Corporation. Phoenix is a trademark of Phoenix Contact.